How many of you have planned a program, a lunch and learn, a book club, etc. and not had many patrons show up to participate? 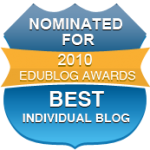 Online, we tend to share our successes but less so, our struggles or dilemmas. In the interest of being “real,” I wanted to share a recent anecdote. Our campus is trying to build a culture of reading, in line with Penny Kittle and Donalyn Miller’s work. We’ve been working on daily ISR in the classroom, building classroom libraries, and other activities, like having teachers share what they are reading on their doors. 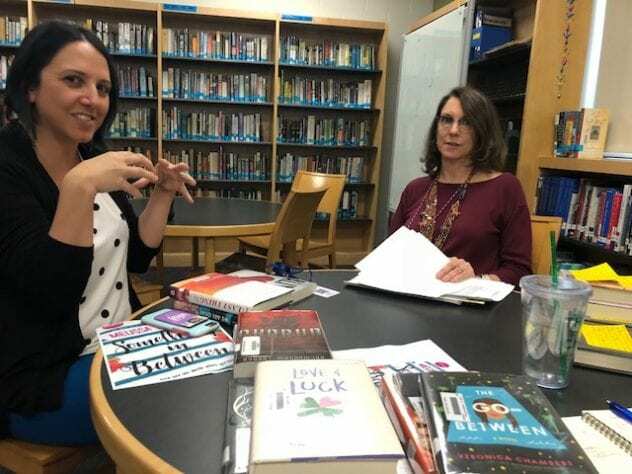 This year, we decided to help communicate to teachers what books are popular in the library and preview hot new titles coming out, since we may be able to better monitor those trends. 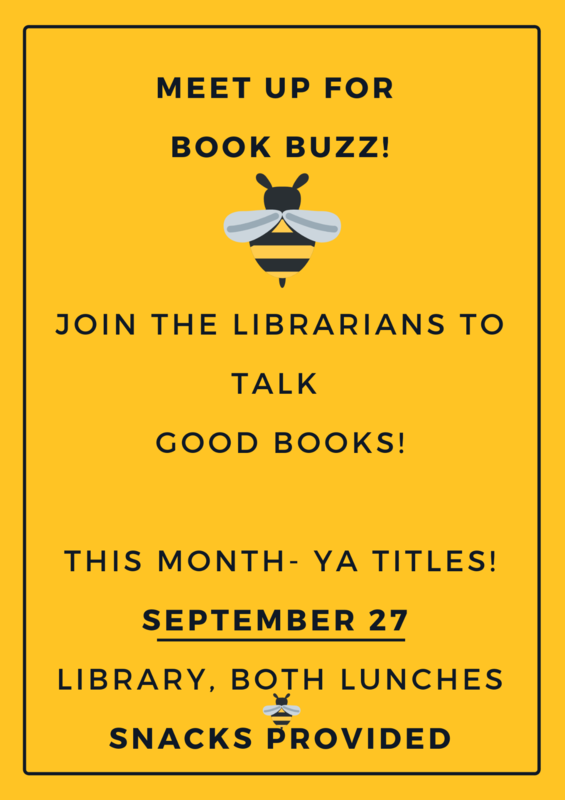 We came up with a idea called Book Buzz, monthly lunch gatherings, where we can create a culture of book sharing. 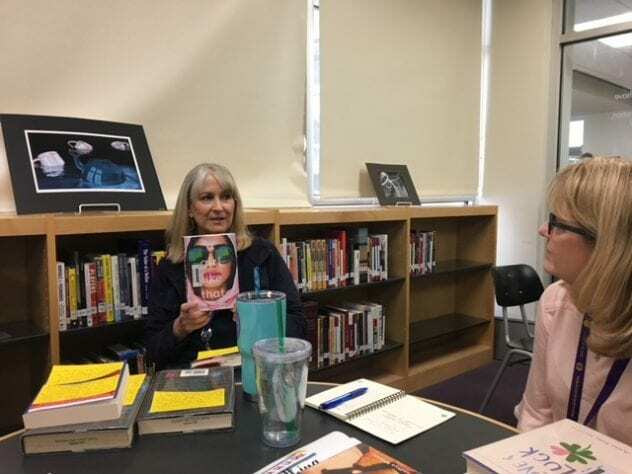 The idea is that each month, the librarians will book talk some hot books on different topics, and then teachers can share anything they are reading. We think getting those opportunities to share reading and authors will strengthen our teacher’s knowledge of what their students are reading. We visited the English department meeting last month and suggested the idea, and the teachers seemed receptive. We were asking whether to hold it during the English teacher PLC meetings so they could “opt in” during a time they already allot, or whether to hold it during lunch so teachers in all departments could attend. We found a date that would work, and scheduled our first one, designed a flyer to put out, etc. We bought snacks for teachers since we weren’t sure how many would attend the first one. 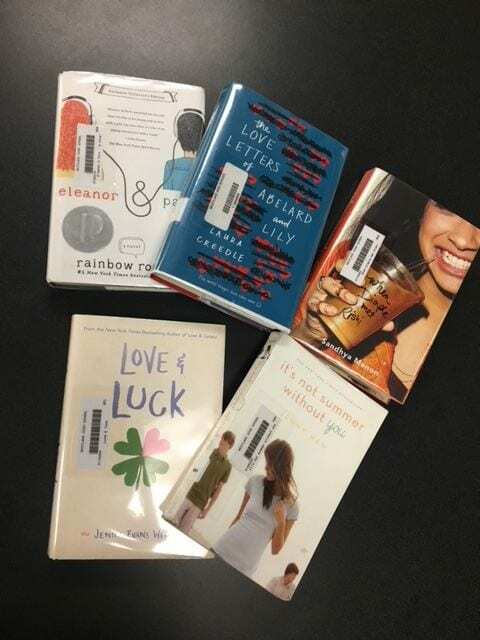 We prepared books to book talk, and also a table full of books that circulated frequently, since some teachers aren’t readers of YA and we wanted them to get a preview. So, what’s the “real” part of this story? Last week was our first Book Buzz. We had a good time sharing books, but unfortunately we only had two attendees one lunch period and nobody during the other lunch period. But how do we craft something that attracts more participants, which is our goal? I want others to share the excitement that our couple of attendees felt about finding new books and authors! I think running any program requires the stamina to be part cheerleader, part patient person, part reflective. When things like this happen, I’m trying to go back to self-reflection. Some things that have occurred to me are: 1) Is there a need–do teachers see the need for this? And how can we speak to that need more clearly, because I think there is a need. 2) Did we survey teachers about the time period to offer this? While I went to a meeting and asked, only a couple of people responded aloud. I am reminded that it’d be better to send a survey and get more specific buy-in from each person at the meeting than a verbal vote. A survey could also allow me to assess the program more carefully. 3) Pitching the program in person. It’s easy to send an email with the flyer a few times, but could we go to each PLC meeting and promote the idea in person? Making those personal connections might improve excitement and attendance or help us pick dates for the events. 4) Does it matter where are we holding it? I like holding events in the library because it highlights the library, but is it better to rotate it to different rooms? This post just reflects a few of the thoughts that might run through my head. But the larger reason for this post is that I want to share what’s real. Online we might share the great photo ops, the Facebook posts, or the tweets, but sharing the reality of our foibles and what DOESN’T work is more rare. But we learn most sometimes by our royal failures, our small misfortunes, or minor disappointments because they cause us hopefully to pick ourselves up and reflect. When I was in the Lilead Fellows, one of the most impactful pieces we read was from John Kotter on the change process. I use it now as a tool to revisit often to help me analyze events after the fact. Kotter suggests 8 reasons why changes fail, and looking at them, I see where we could have done better on these: #1 – Failure to create a sense of urgency #4 Undercommunicating the vision #5 Not removing obstacles to the new vision #8 Not anchoring changes in the organization’s culture. I see that beyond the particular questions I had above, that tackling this in a larger fashion — about how the library fits into the “reading culture” of the school, how we want to help support that, and clearly and repeatedly communicating that vision to teachers would make a difference. This is the power that using reflective tools brings. Another tool for reflection is reaching out to your community. So, I’d love to hear your stories of something that didn’t work and what you learned from it. OR your ideas for our project. The reality is, not everything works the first time and we need to be willing to share our failures. Otherwise we set up librarians in our profession to feel like they are underperforming, or no one else has these experiences. So…please join me in sharing yours!